Like nature itself, the hues in Maureen Bardusk's textile art range from bright to muted. Shapes play against one another in unexpected ways. Now and again, a startling element darts into the frame. Her inspiration comes from the prairie skies, river-flanked woodlands, and gentle topography of her native Illinois. "Earth and Sky," an exhibit of 35 works by Bardusk, is on display through Aug. 21 in the visitors center of Ryerson Woods, a Lake County forest preserve in Deerfield. 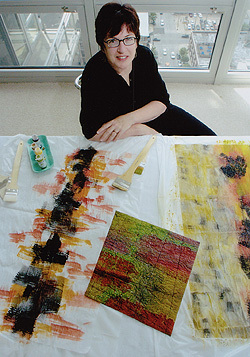 Bardusk created the pieces by backing her abstract landscape painting with a light fleece, sewing them by machine and adding sparse, abstract stitches of embroidery that turn the textiles into a visual canvas — and images that are open to interpretation. So when studying the earth-tone reds, greens and golds of a piece such as "Relative Humidity," viewers must tap into the own experiences with nature. "You don't really know if you're looking up or down or at a vast expanse of land," the artist said. "I hope that [viewers] recognize something in their own lives, so there's some connection that they make. A veteran of the corporate world, Bardusk was for 30 years a docent for the Chicago Architecture Foundation. After nearly three decades in the western suburbs, she now splits her "dual lives" between a Galena studio and the apartment in Chicago's Greektown that she shares with her husband, Joe.